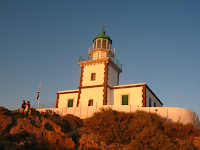 A unique but also romantic and alternative place to admire the sunset (which is amazing these days) is the Akrotiri lighthouse which stands on the southwestern cusp of Santorini. 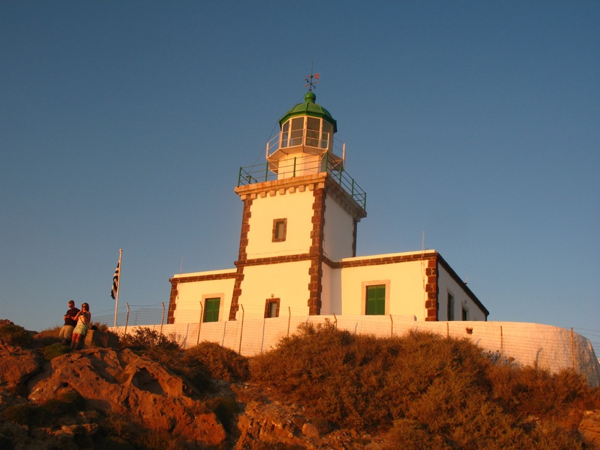 It is one of the two lighthouses of Santorini (the other one was in Oia) and the only one that still exists today. Built by the French company La Société Collas et Michel in 1892, its mission was to guide shipping between Pireus and Alexandria, Egypt. The lighthouse, in fact, lies exactly on the axis of the shipping lane between the two ports. It also guides vessels and cruise ships into the harbor of Santorini or in the caldera, past a popular rock known as “The Indian”. This rock is named after the profile of the face that seems to appear in it.